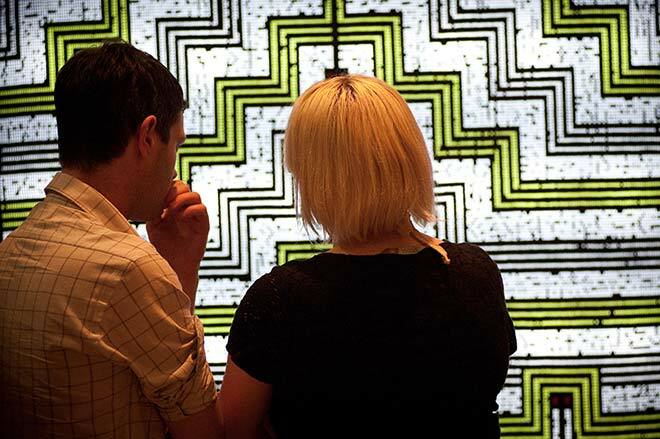 Visitors contemplate 'Pulse' by Peata Larking, an entry in the 2011 Wallace Art Awards at Lower Hutt's Dowse Art Museum. The annual Wallace Art Awards were inaugurated in 1992 by Auckland businessman and philanthropist Sir James Wallace to 'support, promote and expose contemporary New Zealand art and artists'. All visual art forms are eligible, and the competition receives several hundred entries each year. Finalists are exhibited at various New Zealand public galleries.